I hope Kenneth Gladney stayed away from the Whole Foods on Brentwood today. 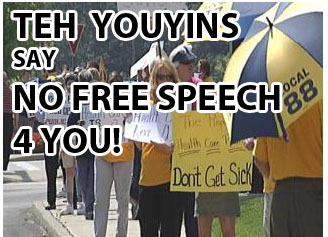 Teh Youyinz protested Whole Foods and seek to jeopardize over 50,000 jobs and the countless charities to which Whole Foods CEO donates his salary because TEH SHOCKORZ! Mackey dared to present an alternate viewpoint! While many of the picketers were involved in organized labor, those who were not affiliated with a union came out to say the health care debate is about making sure everyone is covered. Um, except the ruling party has said that since the bill faltered, it’s no longer about covering everyone, it’s about “cost containment.” Some folks need new talking points. This entry was posted in astroturf, censorship, Healthcare, Lame, Obamanation, REAL Angry Mobs, unions by Dana Loesch. Bookmark the permalink.